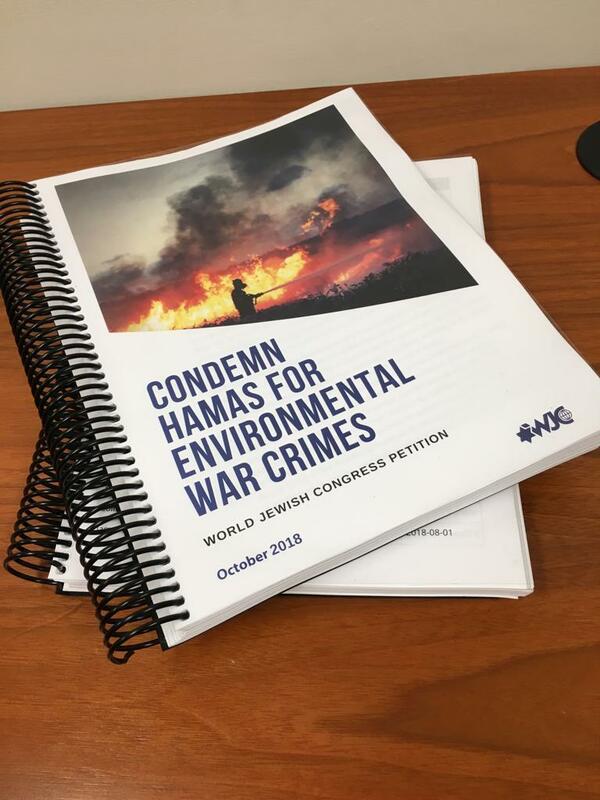 NEW YORK – World Jewish Congress CEO and Executive Vice President Robert Singer on Wednesday presented a petition signed by more than 22,000 people worldwide to Deputy Director of the United Nations Environment Programme (UNEP) Jamil Ahmad, condemning Hamas for causing severe environmental damage to southern Israel. Praising UNEP for its exceptional work in striving to protect the environment, Singer called on Mr. Ahmad and his organization to join WJC and the other signatories in abhorring Hamas' environmental warfare. “The combined effect of these heinous acts over the last five months have killed hundreds of animals, destroyed more than 8,000 acres of land, including 2,700 acres of protected nature reserves, and led to the release of toxic materials into the fragile ecosystem but has also to the release of toxic materials into the fragile ecosystem,” Singer said. “Local wildlife is either killed or forced to flee their native habitats. Forests and farmland have been ravaged. And the livelihood of the thousands of farmers who have committed their lives to turning what was once desert into an oasis has been shattered. It will take years to reverse the ecological damage caused by Hamas,” he said. “Since its inception in 1972, UNEP has done amazing work to protect ecosystems worldwide against natural and deliberate destruction, and we deeply thank Mr. Ahmad and his organization for giving such necessary attention to the well-being of the environment,” Singer said. “We hope UNEP will join us in condemning this environmental warfare and use all necessary measures at their disposal to ensure that these illegal actions cease immediately. As Mr. Ahmad has said, 'animals don’t have passports'. We must do everything in our power to protect the environment against attack." Singer emphasized that under International Humanitarian Law, and protected within UN resolutions, is an express prohibition against the destruction of the natural environment in armed conflict, and yet the international community has remained silent as Hamas wages environmental warfare that endangers civilians, wildlife, and ravages the natural beauty and resources of Israel's southern region. In May 2016, the Environment Assembly of the United Nations Environment Programme reaffirmed UN General Assembly resolution 47/37 entitled ‘Protection of the environment in armed conflict’ which stressed “that destruction of the environment, not justified by military necessity and carried out wantonly, is clearly contrary to existing international law”. Customary international law prohibits employing methods or means of warfare which are intended, or may be expected, to cause widespread, long-term and severe damage to the natural environment.